MOSCOW, Russia -- This was supposed to be a moment of triumph for Ukraine. In just over a month, it is to become the first former Soviet republic to host the European soccer championships, an achievement its leaders hoped would showcase its emergence from an authoritarian past and its embrace of Western values. 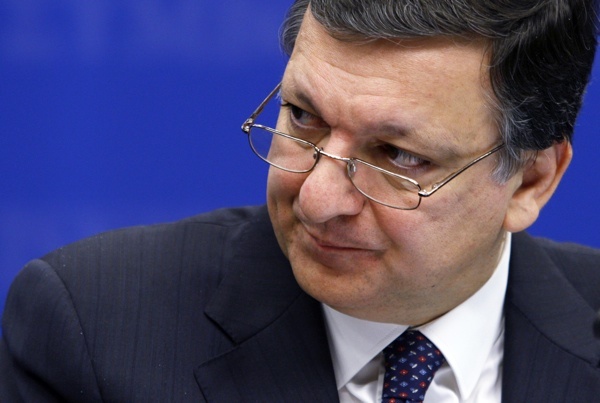 José Manuel Barroso, the European Commission president, said he will cancel plans to travel to Ukraine. Instead, it has devolved into one of the most serious diplomatic disputes in Ukraine’s post-Soviet history. On Wednesday, Austria announced it would join a growing list of European countries and institutions whose leaders are planning to boycott championship matches in Ukraine in protest over the imprisonment of Yulia V. Tymoshenko, a former prime minister who supporters believe has been targeted for reprisals by her main political rival, Ukraine’s president, Viktor F. Yanukovich. Earlier this week, José Manuel Barroso, the European Commission president, said he would also cancel plans to travel to Ukraine, after similar announcements by the European Union’s justice commissioner and a host of less prominent European lawmakers. Germany’s chancellor, Angela Merkel, has said that she is still considering her position and that she will decide closer to the start of the event, called Euro 2012, on June 8. For the European Union, not known for quick and decisive action, it is an unorthodox campaign aimed at pressuring Mr. Yanukovich to change what in Western capitals is increasingly viewed as questionable behavior. “We would like to appeal to President Yanukovich to unlock the European future of the people and the nation of Ukraine,” said Carl Bildt, Sweden’s foreign minister, who was in Berlin for talks on Wednesday and who has not said whether he will join the boycott. “It is he who is blocking,” Mr. Bildt said of Mr. Yanukovich. The scandal surrounding Euro 2012, an event comparable to the Super Bowl in the United States, could have ramifications beyond sports. It will be hosted in conjunction with Poland, a European Union member, and was meant to spotlight Europe’s push for greater inclusiveness in its former Soviet backyard. Instead, it is lingering division on the Continent that has shown most starkly. European officials have accused Mr. Yanukovich, a former Soviet apparatchik, of rolling back democratic advancements of recent years, while Ukraine’s leaders have charged European governments with meddling in their country’s domestic affairs and of harboring anti-Ukraine sentiments rooted in the cold war. At the heart of the dispute is Ms. Tymoshenko, a combative politician fond of designer suits and populist oratory. She has been hailed in the West for her role in Ukraine’s 2004 Orange Revolution, a mass uprising that snatched the presidency away from Mr. Yanukovich after widespread reports of electoral fraud. Mr. Yanukovich and his supporters contend that Ms. Tymoshenko is corrupt and power hungry. The two rivals faced off in a presidential election in 2010 that Mr. Yanukovich barely won. Just months later, Ms. Tymoshenko was arrested. She was convicted of overstepping her authority as prime minister in a natural gas deal with Russia, and was sentenced to seven years in prison last October. If, as Ms. Tymoshenko’s supporters contend, her arrest and imprisonment were part of an effort by Mr. Yanukovich to silence her, then it has clearly failed. In recent weeks, Ms. Tymoshenko has taken charge of the country’s political agenda, particularly abroad, with Western officials seeming to link her fate to the success or failure of Ukraine’s democracy. “We have an interest in Ukraine turning toward Europe, for that reason we are seeking to help Ms. Tymoshenko,” Guido Westerwelle, Germany’s foreign minister, told reporters on Wednesday. He called on the Ukrainian authorities to allow Ms. Tymoshenko, who has complained of severe back pains, to receive medical care in Germany. Last week, she declared a hunger strike after accusing prison guards of beating her. Mr. Yanukovich has yet to comment on the Euro 2012 issue, and calls made to his spokesman on Wednesday went unanswered. European leaders have received unexpected help from Russia, whose leaders typically refrain from passing judgment on issues they consider domestic affairs. “The persecution of political opponents is absolutely unacceptable,” Dmitri A. Medvedev, Russia’s president, said in a meeting with his human rights council last week.